We try to get a whole pig once a year to fill our freezer and we got this year’s pig on Saturday. It’s from Rosegate Farm in Swavesey this time – I hadn’t found them when we looked around last year, but they have been raising and butchering their own pigs, lambs and cattle for about 2 years now. 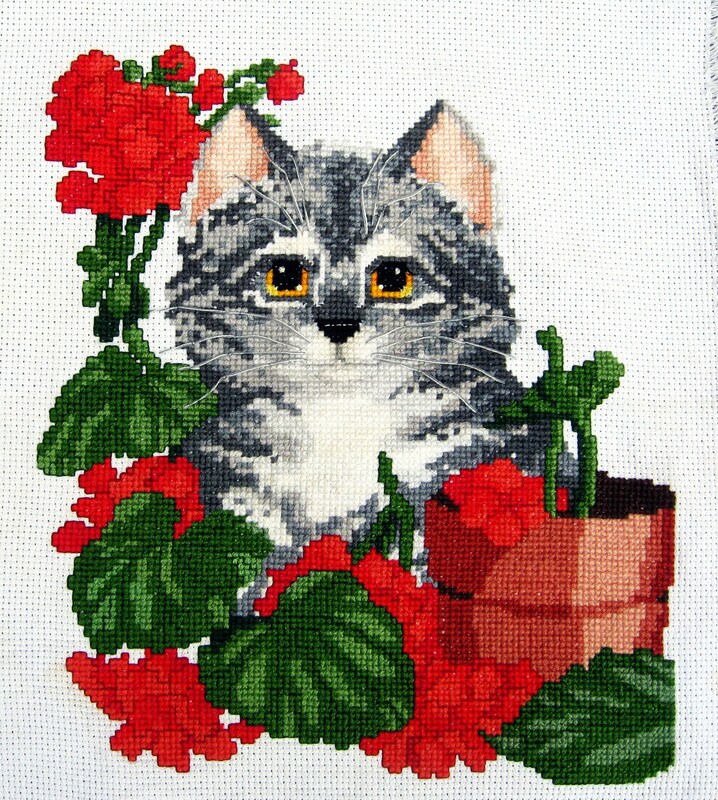 Before then, the farm had only been a soft fruit farm – strawberries and raspberries. Now they have pigs, sheep and Dexter cattle as well. It’s local to us, well, 23 miles away, which is local for me, so I drove down to pick it up from David on Sat. at his little butchery shop on the farm. Our pig was jointed and packaged up in boxes, ready for me to take away. I always get the bones, head and offal as well as the meat – I’ve paid for them, and they make great meals and the bones make great stock. I was slightly surprised to get the lights (lungs) as I’ve never gotten them before, but hey, my neighbour’s dog enjoyed them. The rest of the offal I portioned up and will eat for my lunches over the next few months – I’m the only one in my house that likes liver, heart and kidney. I ordered a shoulder made into sausages – 2 kinds, a local Swavesey recipe and pork & leek (son’s favourite!) and got 2 huge bags of each – all the trim from the joints goes into the sausages, nothing is wasted. There were 15 dozen sausages! The meat was lean, the Hampshire breed, and the first one of these I have tasted – I usually get a Gloucester Old Spot, which can be a bit of a fat pig. I had some liver and a sausage for lunch after packaging up all the chops,sausages and double-bagging the joints for the freezer. It was lovely, mild and not gamey and the sausage was full of flavour. The pig was a good size, about 45-46KG dead weight and was £279 at £6.10/KG. I’m estimating that each meal (3 portions) from it will run about £2. There is no way I could get supermarket meat for this price, and the quality of supermarket meat is bottom of the barrel compared to this meat! The meat itself was gorgeous, very tasty and full of flavour – as it should be from a free range pig. 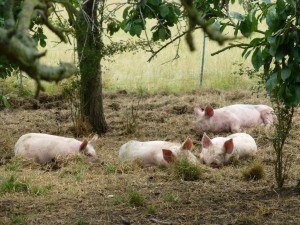 These pigs get to ramble through an orchard eating windfalls and you can tell! Of course, if you read my blog at all, you know I have a ‘thing’ about customer service, and David’s was the best. I had emailed months ago about getting a pig and he replied right away. When we had saved up for the pig, and I emailed again, he said I could have a pig that week if I let him know right away, or in 2 weeks time otherwise. The way I wanted the pig butchered was no problem and he even gave me extra kidneys and bones he had spare. I had the belly cut into pieces and the other half into 3. I have cured 1 piece and we had some for breakfast today. I didn’t use nitrates, so the meat is grey when cooked, but it had great flavour – I used Hugh Fearnley-Whittingstall’s curing recipe from “Everyday” and let it sit in the fridge for 2 days. I might try to get some Cure #1 for the next piece…. The beef and lamb I haven’t tried yet, but when I left, there were 3 people in line waiting to buy lamb, so I think I’ll have to get a joint or 2 to try soon! Opening times are on the website, and you can get frozen meat all year long, while fresh is only available at certain times, but he is beginning to have it more often as the business grows. 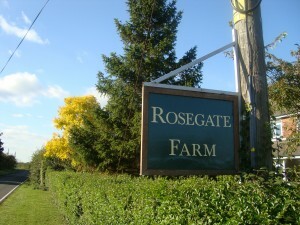 I will definitely be getting more meat from Rosegate Farm! 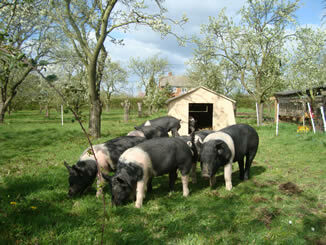 We got another pig from Rosegate Farm today – again, gorgeous meat, yummy sausages and great customer service! David jointed, packaged up the meat and helped me carry the boxes to my car very early today — I was there about 7:45AM! This was a larger pig than last year and we got several extra joints from it. I’m curing a piece of belly pork in a salt/sugar cure for 3-4 days — perfect fried and crispy on top of risotto!